WASHINGTON — Whatever happened to “protest art” — issue-specific, say-no-to-power-and-say-it-loud art? Here we are, embroiled, as a nation, in what many in the art world regard as a pretty desperate political situation. 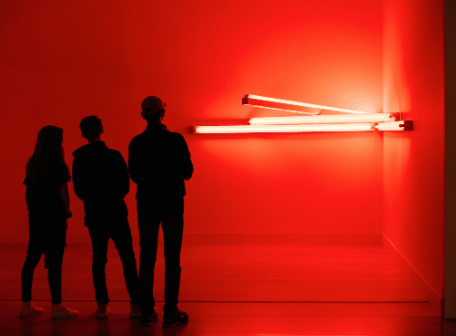 Yet with the exception for actions by a few collectives — Decolonize This Place at the Whitney Museum, and Prescription Addiction Intervention Now, or PAIN, at the Guggenheim and the Metropolitan Museum of Art — there’s scant visual evidence of pushback. Has the product glut demanded by endless art fairs distracted from the protest impulse? Has the flood of news about turmoil in Washington put out the fires of resistance among artists? Has protest art simply become unfashionable? 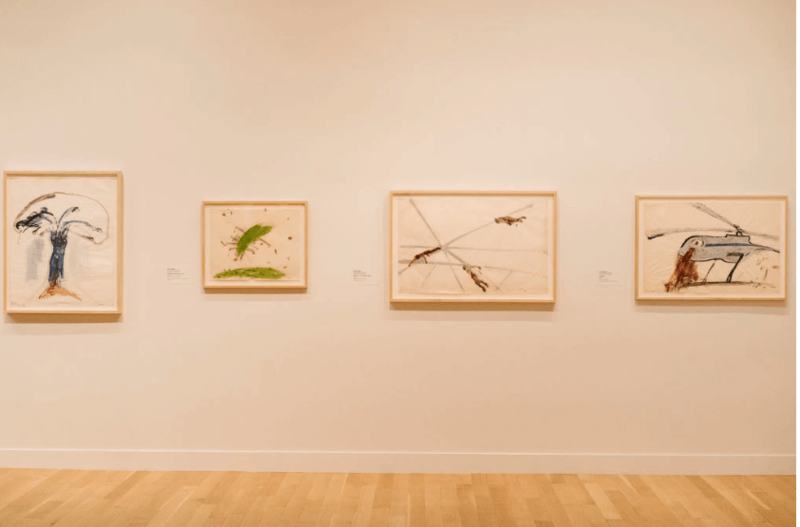 Such questions came to mind on a visit to “Artists Respond: American Art and the Vietnam War, 1965-1975,” a big, inspiriting survey at the Smithsonian American Art Museum here. 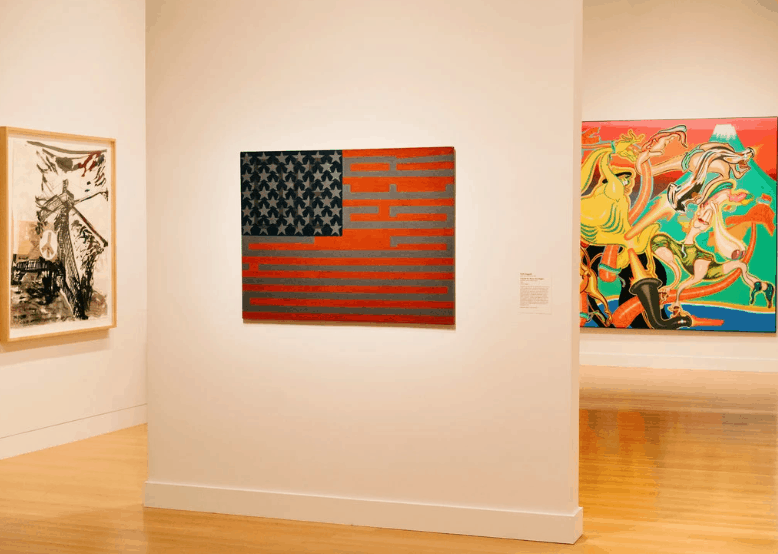 Everything in it dates from a time in the past when the nation was in danger of losing its soul, and American artists — some, anyway — were trying to save theirs by denouncing what they viewed as a racist war. Of the ’60s shows I’ve seen in the past few years, this one is the best, evocative of its time, and in sync with the present. And, importantly, it comes with a second, smaller show that’s far more than a mere add-on. 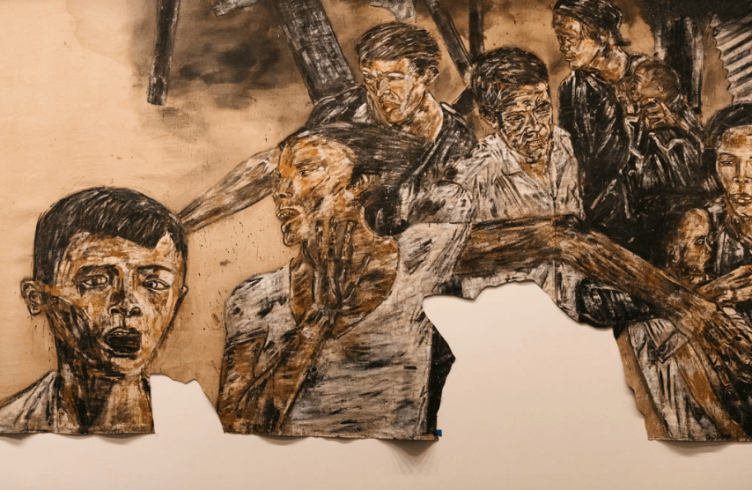 Titled “Tiffany Chung: Vietnam, Past Is Prologue,” it’s a view of the Vietnam War era through Vietnamese eyes, the eyes of people on the receiving end of aggression. In the 1960s — before identity politics, before postcolonial studies — few museums would have thought to do such a show, but it absolutely needed doing. 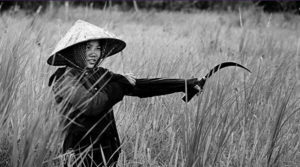 The American involvement in Vietnam was an old and self-serving one, dating back to just after World War II, when the United States began using the Southeast Asian country, under French control since the 1880s, as a buffer, first against Japan, then against global communism. 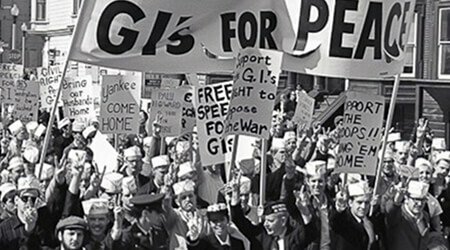 It wasn’t until 1965, though, when Lyndon Johnson sent combat troops s to Southeast Asia, that most Americans, and most American artists, tuned in. As news images of the first “television war” scorched American culture, even artists who normally kept politics out of their work got into swing. Philip Guston, once an Abstract Expressionist, returned to the figure. For sheer comedic savagery, no artist alive can match, his takedowns of Richard Nixon. 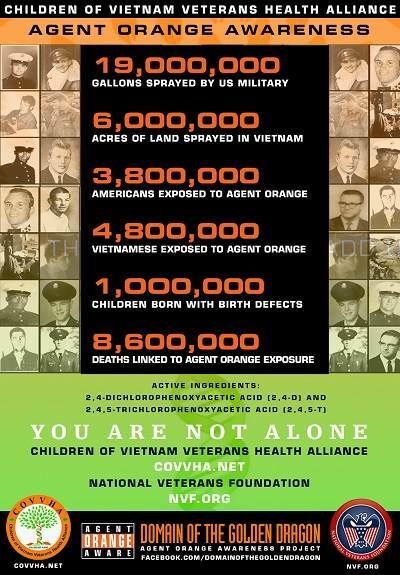 Hypnotically repellent, the picture prompts speculation as to the effect it might have had if enlarged to poster size and displayed at antiwar protests. Some of the show’s most memorable work was designed for exactly that purpose. 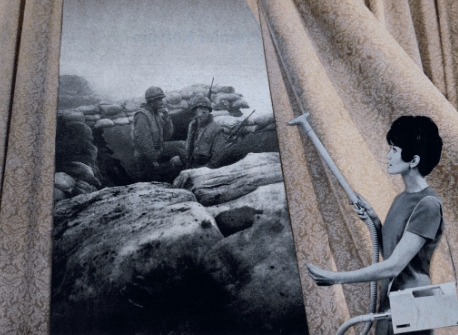 Martha Rosler intended the color photomontages in her now-classic “House Beautiful: Bringing the War Home” series to be photocopied in black-and-white and passed out at demonstrations. Perhaps the era’s single most famous example of artist-made agitprop was similarly conceived as a giveaway. This was the poster titled “Q. And babies? A. And babies” produced in 1970 by the Art Workers’ Coalition. Its terrible image — an army photograph of slaughtered Vietnamese women and children lying dead in a ditch at My Lai — had been revealed to the American public just a year earlier. The Art Workers’ Coalition gave their poster a print run of 50,000 copies and distributed them fast, and free, to feed revulsion against the war. The Coalition never claimed that the poster as art. And in some of the show’s most potent entries the line between aesthetics and politics was left strategically opaque. 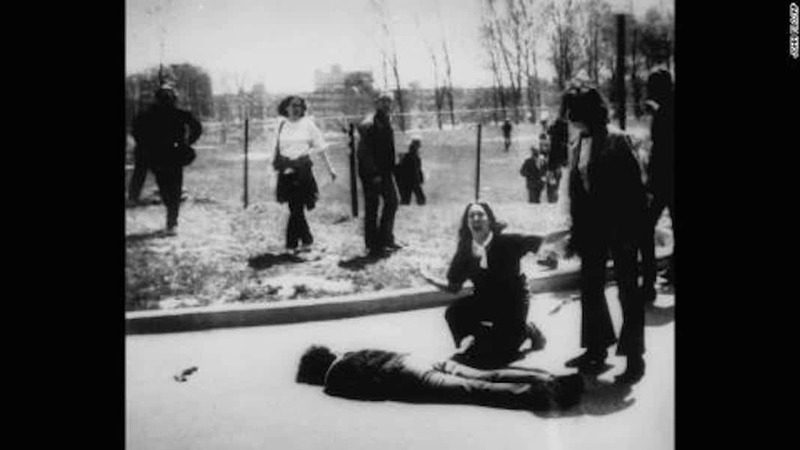 Such was the case with performances, like the one staged by the Guerrilla Art Action Group in the lobby of the Museum of Modern Art in November 1969. After scattering mimeographed fliers around the space, the artist-performers spattered themselves with cow blood, assaulted each other, and fell to the floor as if convulsed with pain. Theatrical too, but in a very different way, was a 1971 performance by the Chicano collective Asco. Their piece took the form of a the Christian passion play, with Jesus carrying a cross through the streets of a city, but with significant updates. The streets were in a hardscrabble Mexican-American neighborhood in Los Angeles. The cross was ultimately used to block the entrance to a local United States Marine Corps recruiting station there, a gesture that pointed to the disproportionate numbers of black and Latino men being sent to Vietnam, to fight an “enemy” with whom they had, economically and socially, much in common. 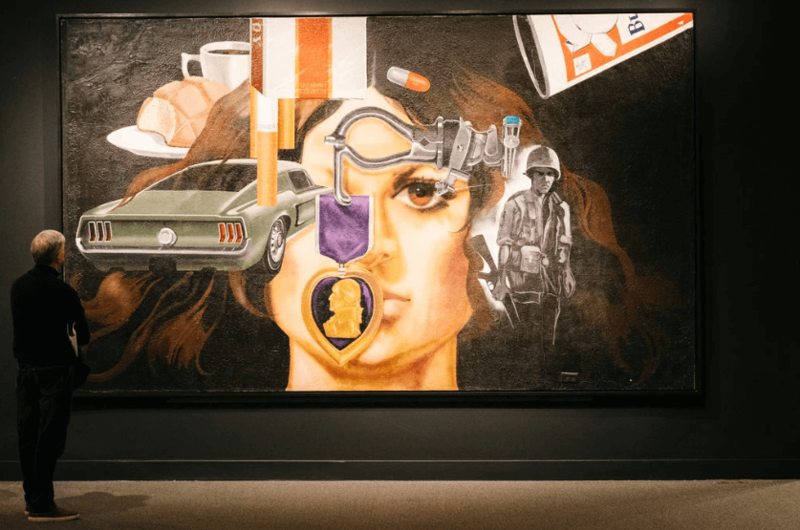 The inclusion of Asco here is an indicator of the museum’s effort to revise the history of Vietnam War-era art — a history that, until recently, excluded artists who had been shut out from the mainstream art world at that time. To this end, the show brings in a number of Latino figures, including Mel Casas, Rupert Garcia, Carlos Irizarry, Malaquias Montoya, Jesse Treviño, and several African-Americans, among them Benny Andrews, David Hammons and Faith Ringgold. And their presence moves the exhibition beyond a focus on a stand-alone peace movement and links it to much older civil rights and anti-colonialist struggles. All but left out of the picture, though, are Asian-Americans. (There are exactly three: Yoko Ono, James Gong Fu Dong and Mr. Kawara.) And this makes the separate exhibition of document-intensive work by the Vietnamese-born American artist Tiffany Chung crucial. Indeed, if Ms. Chung had presented only one component of her complex show, a set of video interviews with an older generation of Vietnam refugees to the United States, that would by itself have been an invaluable contribution. 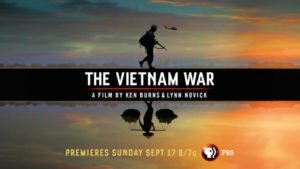 Each interview encapsulates a lived narrative shaped by the effects of a war — in Vietnam referred to as the American War — which killed millions of people and inalterably changed a culture. Some of the speakers are tense with anger; others half mute with grief. Even the most neutral narratives are laced with laments, resentments and regrets. Here you see the personal and political meet, which is extremely moving. You see the same meeting in the larger show, too. It’s somewhat obscured by the public rhetoric and look-at-me style that protest art often trades in, but it’s there. Look again at Mr. Andre’s image of unthinkable and preventable human damage, or Ms. Spero’s spidery warplanes, rendered in strokes as distinctive as a signature; or a mural-size painting by Jesse Treviño. Born in Mexico in 1946, Mr. Treviño was a commercial portrait painter in New York when, in 1966, he was drafted and sent to Vietnam. Badly injured there, he lost his right arm. Returning home, he had to retrain himself as an artist. The painting in the show, begun in 1971 and titled “Mi Vida” — “My Life” — is a result. It’s a kind of time capsule self-portrait set in dreamtime. Cigarettes, pills and beer cans float in the dark. The face of a long-dead friend looms large, half obscured by the form of a prosthetic hand from which hangs a Purple Heart. And in the distance is a ghostly figure of the artist himself, young, dressed for combat, holding a gun, both arms intact. The art of protest comes in many forms, and there’s every reason for it today to keep coming. Ms. Chung, born in Vietnam in 1969, is an example of artist-as-researcher, one who taps into many media — painting, weaving, video, photography, writing — in her investigatory tasks. 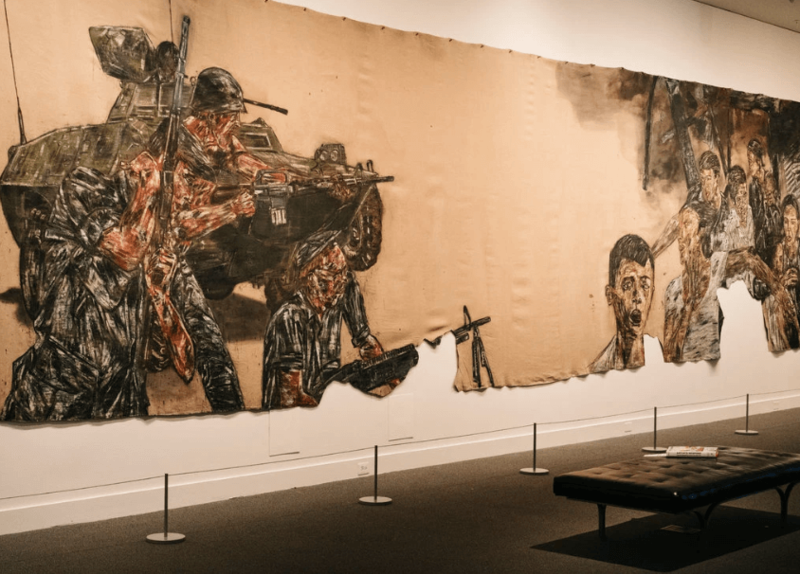 For her solo show, organized by Sarah Newman, the museum’s curator of contemporary art, she approaches the American war in Vietnam, which was also a civil war, through the lens of family history. Ms. Chung’s father was a helicopter pilot in the South Vietnamese Air Force when he was taken prisoner in North Vietnam in 1971. He was held for 14 years. After his 1984 release, he moved with the family to the United States. Apparently, he rarely spoke of his time in combat and captivity, so his daughter tries to piece the story together herself, by assembling old photographs, painting locational maps and composing speculative accounts of her mother’s emotional life, which inevitably colored her own. 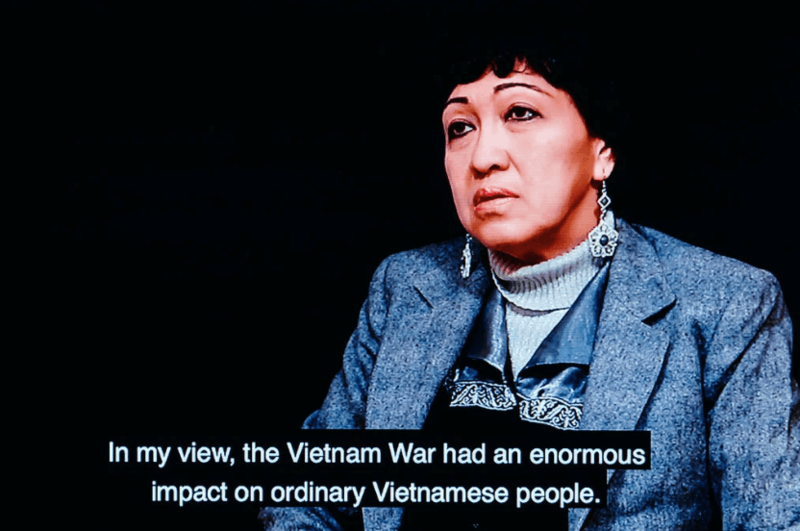 The show’s second section deals with the refugee experience in video interviews with 21 Vietnamese men and women who arrived in the United States in the war’s wake. 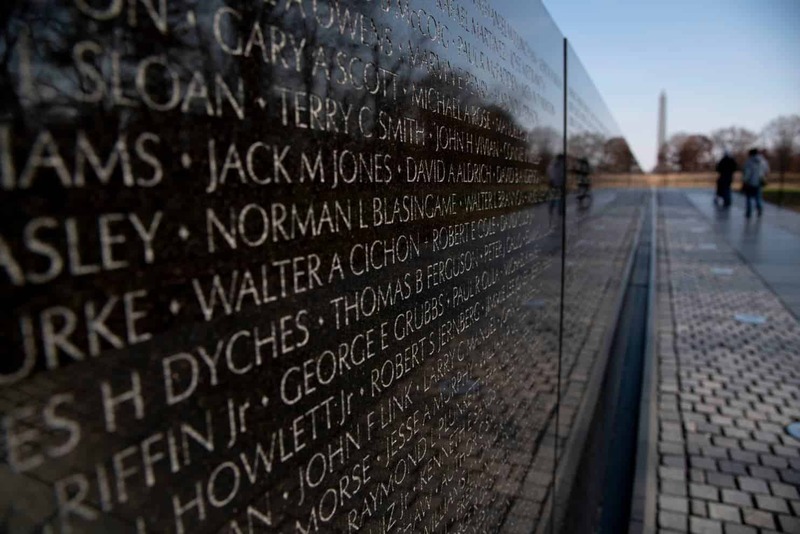 Together they represent a history that has never become part of the American view of the conflict, and that is being forgotten, if not deliberately erased, in Vietnam itself. It’s a history of in-between-ness, of people, now elderly, who identify neither with the country they’ve come to, nor with the one they’ve left behind. Most feel abused by both. In the show’s third and last section, the perspective goes global, and also points to the future. A 12-foot long embroidered world map covers a wall. Lines of stitched colored thread trace the paths of forced South Vietnamese migration across the world. A nearby display of documents from the United Nations High Commissioner for Refugeesin Geneva gives a sense of the archival ardor that has gone into Ms. Chung’s Vietnam project, while a set of small watercolors indicate a way to insure that research continues. 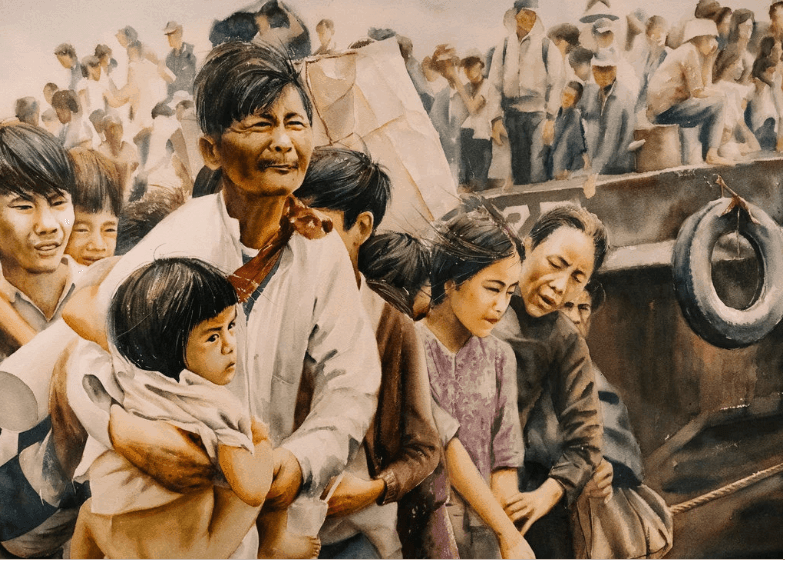 The watercolor images — of migrant camps, food lines, displaced families, crammed and capsizing boats — are paintings based on photographs taken in the 1970s and ’80s, when the fallout from war was most crushing. They were created recently by young Vietnamese artists, commissioned by Ms. Chung, in Ho Chi Minh City. Most had no knowledge at all of the past depicted. Now they do. Smithsonian American Art Museum, Washington; 202-633-7970, americanart.si.edu.